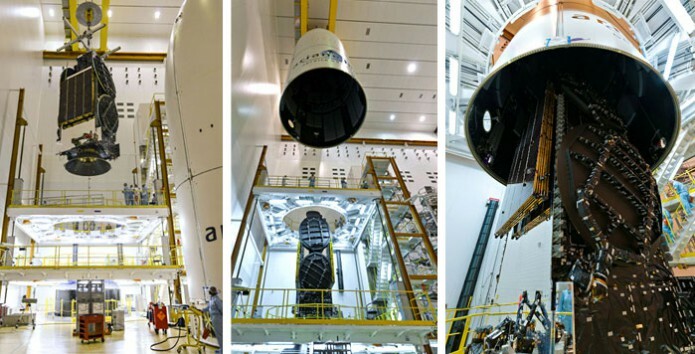 In this photo sequence from the Spaceport’s Final Assembly Building for Ariane 5, DIRECTV-14 is readied for mating to the SYLDA dispenser unit (image at left), followed by its encapsulation with the payload fairing. The upper passenger for Arianespace’s dual-satellite launch from French Guiana next week has been encapsulated in its protective payload fairing, preparing the DIRECTV-14 relay platform for its integration on Ariane 5. During activity in the Spaceport’s Final Assembly Building for Ariane 5, DIRECTV-14 was mounted on the launcher’s SYLDA dispenser unit, followed by the lowering of a large ogive-shaped payload fairing over the combined unit – creating the mission’s “upper composite” section. With this step completed, the upper composite is now ready to be integrated on the launcher by its positioning atop the mission’s other passenger, India’s GSAT-16 satellite, which is to be integrated on Ariane 5’s core cryogenic stage. DIRECTV-14 is the larger of Ariane 5’s two passengers on the December 4 mission, and will serve as a 20-kilowatt class Ka-band and reverse-band digital broadcast satellite to deliver Ultra HD and other new consumer services for DIRECTV. Based on the SSL (Space Systems/Loral) 1300 spacecraft platform with a liftoff mass of approximately 6,300 kg., it is to provide service for users across the U.S. (including Hawaii and Alaska) and Puerto Rico. The GSAT-16 satellite that also will be launched on the upcoming Ariane 5 mission was developed by the Indian Space Research Organisation (ISRO), and carries Ku- and C-band transponders to further augment communication services across India. GSAT-16’s liftoff mass is estimated at 3,180 kg. Arianespace’s December 4 launch is designed Flight VA221 in the company’s launcher family numbering system, signifying the 221st liftoff of an Ariane family vehicle from the Spaceport.